Actions games are the best genre to play when you drained out after all those droning classes and boring business meets, nothing acts as a better stress buster than a solid action game, which lets you square off against super villains or shoot at endless hordes of the undead. Here is our pick of this week best action game for Apple watch platform. 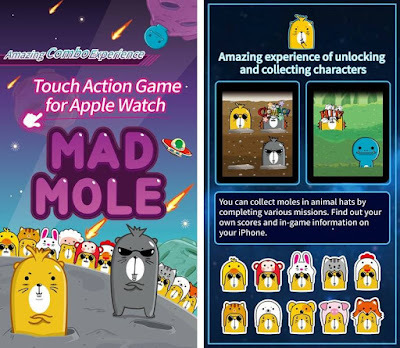 Sit back relax and read carefully this review about newly developed action game MADMOLE – Mole Smash Tapper Action. What is MADMOLE – Mole Smash Tapper Action? MADMOLE – Mole Smash Tapper Action is casual tap smasher action platform game where your task is to fight against the moles to kill them and smashing other creatures pops at the same time along with these moles. When you start playing this game, you will see some holes on the game screen from which both the moles and these creatures are coming out randomly, now you have carefully to tap that hole from which these moles are coming out and tap that part of the screen to smash it. Limited span of time for each level with defined score. Easy to learn and start. Easily share your score with your friends. Track your own score with iPhones by visiting game information on your devices. Have an unlimited fun with these smash game features. Do not miss a second to download this fast-paced action game free on your Apple watch device. Direct download link to the app present below.